You would imagine songwriters like Paul McCartney, Carole King, Bob Dylan, Joni Mitchell and Elvis Costello et al would never have to worry what other songwriters thought of their material or whether it would affect their career, but it seems that in 1983 Elvis Costello got a little anxious about a new up and coming writer called Roddy Frame and claimed, at the time, that it kept him on his toes. How does someone react to that? Let’s find out. Frame was born in East Kilbride in 1964, started learning guitar at the age of four and cited David Bowie as one of his biggest influences. 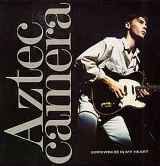 After leaving his first band, Neutral Blue, in the early eighties, he formed Aztec Camera bringing in a myriad musicians for various albums and tours. The most consistent member was bass guitarist Campbell Owens who was with him for the first five years. They signed to Postcard records, a small local independent label co-owned by Orange Juice’s Edwyn Collins. This led to them being discovered and championed by both John Peel on Radio One and the NME. Aztec Camera’s debut hit was Oblivious which stalled at number 47 followed three months later by Walk out to Winter, both songs gained a reasonable amount of airplay on Radio One particularly by Peter Powell and Kid Jensen but neither did well on the chart. Oblivious was re-issued towards the end of 1983 and did much better by reaching number 18. This is when Elvis Costello made his confession which Frame took in his stride and before-long was invited to join Costello as support on his Punch the Clock tour in America. After nearly four years away from the chart and the limelight, the reason for which was he confessed he’d become a Coronation Street fan, “I was meant to be churning out these new songs and I was getting completely wound up in the Barlows and the Tilsleys, then I went down the pub and read a bit and got really lazy, then I had to start putting a record together,” he returned with the album Love and the first single released was the beautiful How Men Are. Roddy’s songwriting had taken a big step up and was being compared to many other legendary songwriters. To come out with the line, ‘Why does it take the tears of a woman to see how men are’ is very powerful. The song reached number 25 but the follow-up, Somewhere in my Heart, will always be his swansong. So, as Frame said to Tom Doyle in a Mojo interview, Somewhere In My Heart nearly didn’t make it to the album because it was deemed a bad stylistic fit. “I didn’t really get it until I was being driven down Ladbroke Grove one day and the sun was shining and someone was in a convertible and I heard it blaring out on their radio. It’s one of those songs.” On the recent Radio 1 Vintage pop-up station, Simon Mayo confessed it was one of his favourite singles and chose it as the first song he played on his first-ever Radio 1 breakfast show. Roddy embarked on a solo career in 1998 and has released four studio albums to date; The North Star (1998), Surf (2002), Western Skies (2006) and Seven Dials (2014) the latter one reaching number 50 on the UK albums chart. On the back of that success he continued writing songs and played some live dates around the UK, but he’s been very quiet since Christmas 2015.